It was late July. We struggled up a rough trail to the southeast of Eagle Cap, in a hurry against the enchroaching evening shadows. The path didn't look very official, more like a climber's trail. The wind became a penetrating chill as we topped a final ridge and realized there would be no rest at this ice-choked lake! "Prospect Lake," my eye! No prospect here except a rocky and miserable night! Truly, this body of icewater gave no clue that it was midsummer. 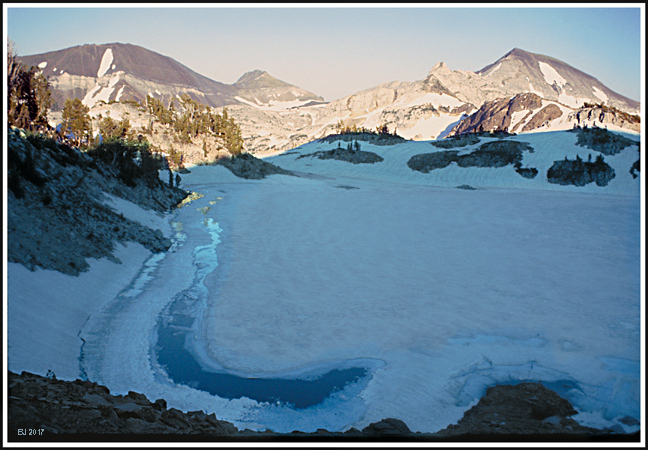 Turning tails, we stumbled downhill and wearily pitched our tents by flashlight at a lower and more benign lake (Glacier Lake). Below, same image as above, processed much differently. The Minam River is nearby. Minam River. Minam River. 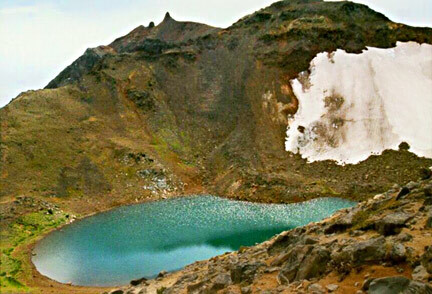 12 air miles NNW of Prospect Lake lies what is Oregon's highest true lake. It's little-known, little-seen, Legore Lake, elev. 8957, at the head of Falls Creek. It's a bitter climb up the west canyon wall of Hurricane Creek. The route uses the old trail to Legore Mine; this trail leaves Hurricane Creek at only 5,200 feet elevation. You must climb nearly 4000 vertical feet in about 4 trail miles of extremely steep uphill, and the last 0.5 mile from the mine trail is rugged cross-country travel to the lake, which is roughly one third the acreage of Prospect Lake....Legore lies on the north slope of the Twin Peaks, 9673 ft.... Interestingly, Legore Lake, for all its remoteness, perches only 6 air miles from the tourist distractions of downtown Joseph! The image below is compliments of photographer Mike Hays, who lives in adjacent North Idaho. 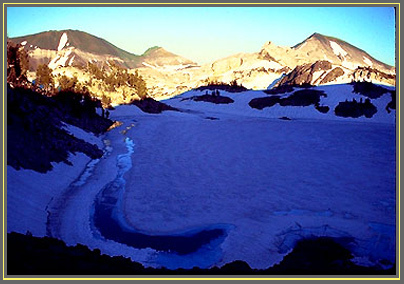 Shown are Legore Lake, Twin Peaks and a permanent snowfield, looking rather dirty in this late summer picture.